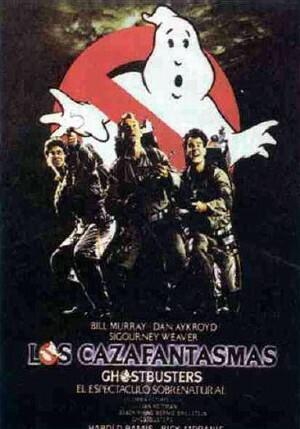 Los doctores en parapsicología Peter Venkman, Raymond Stantz y Egon Epengler crean la empresa "Los cazafantasmas" al dejar de recibir apoyo del centro universitario donde estaban trabajando. Su trabajo más importante es librar a New York de incordiantes ectoplasmas . Bill Murray, Dan Aykroyd, Sigourney Weaver, Harold Ramis, Rick Moranis, Annie Potts, William Atherton, Ernie Hudson, David Margulies, Steven Tash, Jennifer Runyon, Slavitza Jovan, Michael Ensign, Alice Drummond, Jordan Charney, Timothy Carhart, John Rothman, Tom McDermott, Roger Grimsby, Larry King, Joe Franklin, Casey Kasem, Reginald Vel Johnson, Rhoda Genignani, Murray Rubin, Larry Dilg, Danny Stone, Patty Dworkin, Jean Kasem, Lenny Del Genio, Frances E. Nealy, Sam Moses, Christopher Wynkoop, Winston May, Tommy Hollis, Rick Mancini, Kathryn Janssen, Stanley Grover, Carol Ann Henry, Frances Turner, Nancy Kelly, Paul Trafas, Cheryl Birchfield, Ruth Oliver, Kymberly Herrin, John Ring, Joe Cirillo, James Hardie, Eda Reiss Merin, Norman Matlock, Bill Couch, Joe Schmieg, Paddi Edwards, Carol Henry. Ivan Reitman (Dirección), Laszlo Kovacs (Montaje), Dan Aykroyd, Harold Ramis (Guión), Elmer Bernstein, Ray Parker Jr. (Música).